What made you take up yoga in the first place? My 2017 New Year resolution was to be a stronger (and kinder) person as I turned 60. In particular I wanted stronger legs. I will surely need them to carry me off into the sunset. However, a more immediate need is to “fix” my weak knees, in the hope that I can squat comfortably again (until then, I have to avoid all Eastern style toilets). As someone who dislikes physical exercises, I have limited options. Yoga seemed like a good way to start. Shortly into the new year, I saw “Yoga for Inflexible People” advertised on Facebook. Wow! This course is tailor-made for me, I thought. So, on Saturday 4 February 2017, I started my first KPY class. Was your first encounter with yoga what you had expected? I had tried a bit of yoga at a community centre near home some 20 years ago. Don’t remember much except some stretching exercises and the teacher’s constant boasts about how yoga kept her looking young. Guess that was her way of encouraging her students. On the joining of KPY, I had no particular expectation – the naive me thought that fellow students would be, more or less, inflexible like me. Haha. Even as I found myself to be the least flexible, I enjoyed my Inflexible People classes. James, the teacher then (and Samantha and Sheela), took the trouble to understand the issues I have – neck, back and knees. They would adjust my poses to what I was capable of doing (which was not much). What classes do you enjoy most today? I continued with Saturday’s Inflexible People class until it clashed with my language lessons. I then switched to the 8.30am Sunday class for beginners with Li Ling. I look forward to waking up early on Sunday to attend class. I also tried MyoYoga on Wednesdays and I really get a masochistic kick from rolling hard balls over sore parts of my body. What do you gain most out of your yoga practice? Yoga helps me to be in touch with my body. I am the sort of person who “lives” in the head, ignoring that bulk supporting the skull. At class I enjoy concentrating on what the teacher says as she guides us into the poses. This tells me if I am doing the pose appropriately. More than that, it teaches me to “feel” the different parts of my body – some for the first time in my life! 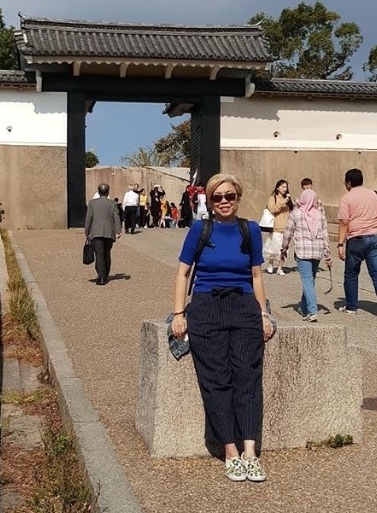 Peggy and her love for all things Japanese. 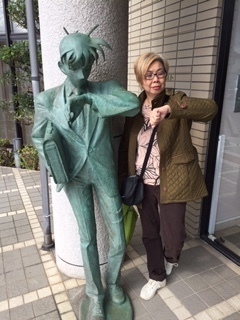 She is seen here with Detective Conan (anime character) at Tottori. What do you think of the ‘Yoga for Normal People’ promise? “Yoga for Normal People” underscores KPY’s inclusive approach towards yoga. Many studios choose to define themselves as exclusive or special. After all, yoga has been glamourised by celebrities from the Beatles to the likes of Madonna and Lady Gaga. 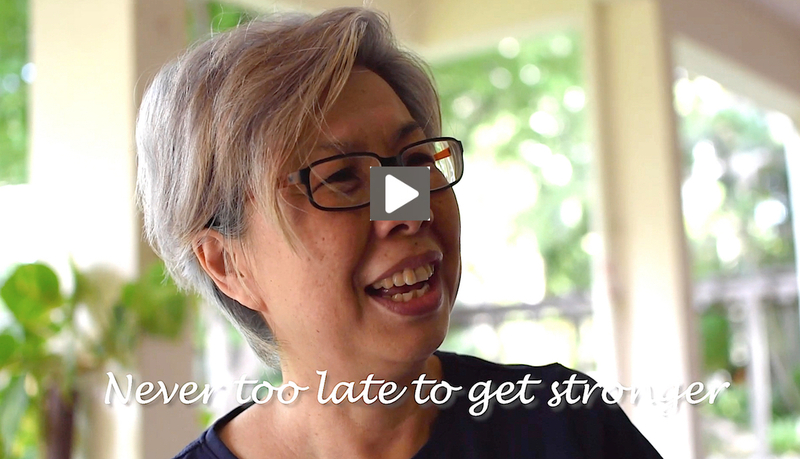 KPY wants to bring yoga back into the community, for the individuals and their families regardless of age, gender or level of natural ability. Yoga can be a part of our lives. What do you think is the KPY difference? I don’t have much experience with yoga studios but imagine that classes are held in large bright modern air-conditioned rooms where students are always checking their reflections on the wall-to-wall, floor-to-ceiling mirrors, making sure that they are in sync with the ones on the next mats. In contrast, KPY has a homely intimate feel that puts me at ease quickly. The naturally ventilated rooms are kind to my dry skin and wet nose (eczema & rhinitis). But I believe the main difference is in KPY’s philosophy of treating each student as an individual, not just teaching the class as one entity. No mirrors at KPY to feed anxieties about imperfect bodies. No need to compare poses with the neighbour – as Li Ling would say, in jest, your neighbour is probably doing the pose ‘incorrectly’ as each person’s body and practice is different. What is your key message to people like you who have yet to take up yoga? There is no denying the ravages of ageing. All the time I see older folks shuffling along with small uncertain steps, struggling to get up and down buses and straining to lift their behinds off the seats. Yoga at KPY offers a safe and gentle way to strengthen bodies and calm minds. To read about the other Friends of KPY, click here. To make a booking for a class, register online now and get started today.